The trend in macroeconomic terms on the Italian market continues to be positive at the beginning of 2018, although the growth of Italian productivity is lower compared to other European countries. The very high public debt remains a heavy burden on the Italian economy and a major source of vulnerability, especially in the context of protracted weak growth. The figures for 2017 relating to the public debt and presented in the Economic and Financial Document showed that public debt is equal to 130.8 per cent of GDP. In 2018, the debt-to-GDP ratio is expected to be 130.8 per cent, thus confirming the reversal trend of recent years. Overall, companies' financial positions have continued to strengthen gradually; bankruptcies have diminished by 4.6 per cent compared to the previous year. In this context, the existence of huge amounts of non-performing loans still represent a serious concern for Italian financial markets. On this point, great attention should be paid to the innovations brought by Law Decree No. 18 of 14 February 2016, as subsequently amended, which introduced a public guarantee mechanism applicable to securitisation procedure of non-performing loans, thus improving the economic value of doubtful loans and the stability of the financial system as a whole. The latest figures related to insolvency and bankruptcy procedures have shown a steady improvement over the previous year. Statistics from the archives of the Cerved Group SpA show that, in the first quarter of 2018, 2,945 companies applied for a bankruptcy procedure – a decrease of 4.6 per cent compared to the 3,087 bankruptcies of the previous year. This is the lowest value observed in the first quarter of a year since 2010. Furthermore, the decline in non-bankruptcy proceedings continued at a steady pace: 370 procedures were opened in the first quarter, 16 per cent fewer than in the same period of the previous year. At the origin of this improvement, there is the sharp decrease in the filing of composition with creditors procedures (concordato preventivo): only 112 petitions were filed between January and March, -35 per cent lower on an annual basis and a level far below the peak observed in 2014 (more than 500 petitions). On the other hand, compulsory liquidations and voluntary liquidations returned a state of increasing. The first was mainly because of increases in defaults among cooperatives; the second, mainly because of the closure of many 'dormant companies' (registered but de facto non-operational). This is, in summary, the picture emerging from the data relating to bankruptcy proceedings and voluntary liquidations opened in the first quarter of 2018. The main source of Italian insolvency law is Royal Decree No. 267 of 16 March 1942 (the Insolvency Act), as amended and integrated from time to time by the Italian legislature. The Insolvency Act provides for several bankruptcy and restructuring proceedings that have been amended in the last years and some of which are described below. A bankruptcy proceeding is the most invasive procedure for a debtor. The law specifically indicates which debtors are subject to the bankruptcy procedures (not all debtors can fall bankrupt). In general, the bankruptcy procedure applies to any company or individual entrepreneur whose main activity consists of the production or trade of goods and services. A debtor is declared insolvent when it is no longer able to regularly meet its payment obligations through ordinary means. The insolvency status is per se a situation that justifies a declaration of bankruptcy by the relevant court, even if the insolvency has not been caused by the debtor's misconduct. The procedure is started by an order of the court having jurisdiction over the debtor's principal place of business on the basis of a petition, which may be filed by the debtor itself (or the directors of the debtor company), a creditor, the public prosecutor, or the bankruptcy court ex officio. The proceeding is carried out and supervised by a receiver (appointed by the court), a deputy judge and a creditors' committee representing all the creditors. Upon declaration of bankruptcy by the court, the debtor no longer has the legal right to manage its business and dispose of its assets. All legal individual actions taken by the creditors against the debtor and its assets are suspended. The receiver is a public officer and is required to perform his or her duties in person. The receiver is paid through the debtor's assets, and such remuneration ranks as senior over the creditors' unsecured claims. The insolvency law imposes certain specific duties on the receiver: in particular, to manage the company's assets and operate the business in the interest of the creditors. His or her main task is that of disposing of the company's assets and distributing the relevant proceeds to the creditors, who will be reimbursed according to a distribution plan, which must respect the order of claim priorities established by the Italian Civil Code and by several provisions of the Insolvency Act, and be certified by the court. Priorities are normally granted to claims secured by pledges, mortgages or other liens voluntarily granted by, or imposed on, the debtor. Claims of Italian and foreign creditors rank equally. Before the execution of the distribution plan, the receiver must submit a final report to the deputy judge with a full description of all the activities carried out in managing the debtor's assets as well as in administering its business. Creditors may object to the final report. Once the motions have been decided, the deputy judge orders the implementation of the distribution plan. Creditors are always entitled to file oppositions against the distribution plan in order to obtain payment of any unrecovered portion of their claims and of interest thereon. Bankruptcy proceedings may also end up with a settlement accepted by the creditors, as described below. It is worth noting that significant changes to the bankruptcy proceedings have been introduced by Law No. 132/2015 (see Section III). The Insolvency Law allows creditors and, under certain circumstances, the debtor to have recourse to a settlement procedure in bankruptcy. In particular, once the court has set out a timetable for the distribution of proceeds, a settlement proposal can be submitted by a creditor or the debtor, provided that the proposed settlement, in principle, guarantees a greater or faster recovery than the one envisaged under the bankruptcy distribution. If the court decides that the settlement proposal is in the best interests of the creditors, the court will order the notification of the proposal to all creditors for their approval. For the settlement to be effective, the proposal has to be accepted by the majority of creditors. While the bankruptcy procedure is highly regulated and is under the full control of the court and the receiver, the amendments to the Insolvency Act enacted in recent years have granted a higher level of autonomy to the debtor in the context of the composition with creditors' proceedings. In general, a company applies for protection under a composition procedure (concordato preventivo) when it is either insolvent (but believes it is in a position to be able to repay its creditors, at least partially) or is in financial crisis but not yet insolvent. The court, once it has admitted the company to the procedure, appoints a commissioner who acts as a public observer. During the procedure, the assets continue to be managed by the debtor, while the commissioner supervises the management of the company in the interest of the creditors. an estimate of the value of the debtor's assets and particular categories of creditors. The concordato plan must indicate how and in which percentage the creditors will be repaid and needs to be accompanied by a report, drafted by an independent third-party expert, certifying the correctness of the data reported and the feasibility of the plan itself. The commissioner, inter alia, expresses his or her opinion on the feasibility of the concordato plan. As a general rule, the concordato plan must be approved by the majority of the unsecured creditors while secured creditors do not vote to the extent that the plan envisages the repayment of their claims in full. The procedure is regulated by the court, which plays a key role in terms of supervision and implementation. Although an intensive debate exists regarding the admissible level of court intervention, much depends on the approach of the territorial court where the procedure is started. Another significant characteristic of the composition procedure is that, once approved with the prescribed majorities, the concordato plan is binding on all creditors (even those dissenting). The debtor may anticipate the effects of a concordato procedure by submitting a petition for composition with creditors without a concordato plan, and postponing the filing of the plan and of all the other documents required by law at a later stage (the pre-concordato request). The pre-concordato request must be filed together with the three latest approved balance sheets of the debtor and a detailed list of all its creditors. The condition for the admittance is that a petition for concordato was not unsuccessfully filed by the debtor in the previous two years. Following the filing of a pre-concordato request, the court, subject to its positive evaluation of the same, admits the debtor to the pre-concordato phase, granting a term between 60 and 120 days (which can be extended for no more than 60 additional days) for filing the concordato plan and all other related documents. The pre-concordato proceeding is intended to allow the debtor to seek immediate protection against enforcement or interim actions brought by individual creditors. During the pre-concordato phase, however, all activities exceeding the ordinary course of business must be authorised by the court. The court often sets thresholds of value above which such authorisation is required. During the pre-concordato phase, the debtor must provide certain periodical information (mainly financial) to the court, and the court appoints a judicial officer to monitor the company's activities is the interest of all creditors. Along the same lines, the debtor is allowed to terminate unprofitable or excessively burdensome unperformed contracts with the prior authorisation of the court. This is aimed at preserving the goodwill of the debtor and increasing the chances of its recovery. In the past years, certain groundbreaking changes have been made to this procedure. In particular, creditors are now allowed to submit competing concordato proposals or offers, provided that certain requirements are met, and debtors may be authorised by the court to obtain interim financing with super priority status. For more details, see Section III. Article 182 bis of the Insolvency Act provides the rules governing the debt restructuring agreement. Debt-restructuring agreements are private agreements whereby the debtor and creditors representing at least 60 per cent of the total credits reach an agreement on the restructuring and repayment of the debtor's debts. Restructuring agreements need to be validated by a third party independent expert as to their feasibility and are subject to confirmation by the competent court. Dissenting creditors, however, are not bound by the restructuring agreement, and their claims need to be repaid in full within 120 days of the date when the court approves of the restructuring agreement, if this is longer, it is from the date when the relevant debts become due. 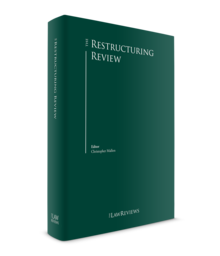 furthermore, during the restructuring procedures, the provisions of law imposing the reintegration of corporate capital in the event of losses are not applicable. This is designed to give a distressed company a breathing spell to prepare a restructuring plan without the pressure of complying with corporate capital requirement and injecting new equity when the survival of the company is still in doubt. It is worth noting that Law No. 132/2015 introduced the new Article 182 septies providing for a 'special' debt restructuring agreement, applicable in case the majority of the total debt is towards banks or credit institutions. For further details, see Section III.vi. Compulsory administrative liquidation is an administrative procedure controlled by state officers instead of by the courts. The procedure is used when the debtor's business is deemed to be of public interest, such as insurance companies, banks, cooperatives and non-profit entities, which are subject to a number of governmental controls. The purpose of this procedure is to achieve recovery of the business through a settlement or an arrangement plan. The debtor, the directors of the debtor company and any of the creditors are entitled to apply to the court in order to start the procedure. The court is under the obligation to seek the advice of the governmental agency responsible for supervising the debtor's enterprise. The judge may initiate the proceedings by declaring the insolvency of the debtor and appointing a liquidator. All legal actions by creditors against the debtor are then suspended, with the exception of those aimed at ascertaining the amount of the claim. The liquidator, who also acts as a public officer, is assisted by a supervisory committee consisting of a number of experts, whose number can vary from three to five and who are not required to be creditors of the debtor (even if this might be preferable). Unlike in other insolvency proceedings, there is no requirement for a judge or a commissioner to be in charge. The liquidator must review the claims and evaluate whether the settlement plan is feasible. The extraordinary administration procedure applies to big companies falling within certain specific requirements, the occurrence of which is checked by the relevant court where the request for the extraordinary administration procedure is filed. The procedure applies to companies employing no less than 200 employees for at least one year, and having an overall amount of debt, the value of which is no lower than two-thirds of the aggregate value of both assets and revenues. For the application of the extraordinary administration, the company must have 'concrete chances for the recovery of its financial stability'. After consultation with the Ministry of Economic Development and the Ministry of Economy, the court issues an order declaring the insolvency of the company. The Ministry of Economy appoints an 'extraordinary commissioner', who proposes a plan for the disposal of the assets or a recovery plan within 60 days of his or her appointment. All legal actions initiated by creditors against the company are suspended as a consequence of the foregoing order. Special variances of the extraordinary administration procedure apply to (1) large companies employing no less than 500 employees in the year preceding the filing of the relevant petition and having debts amounting to, or exceeding, €300 million, as well as (2) large companies operating in strategic public services. According to the provisions of the Italian Civil Code, the directors of a company must act with a duty of care, avoid conflicts of interest and comply with the law and the company's by-laws in the day-to-day management of the company. In all cases, the directors are jointly liable if they fail to adequately supervise the general conduct of the company's affairs or if, being aware of prejudicial acts, they do not act in order to prevent any harmful activities, or to eliminate or reduce the harmful consequences of such activities. Liability for acts or omissions of directors does not extend to any directors that, acting without fault, express their dissent without delay, such dissent being registered in the minute book of the meetings and resolutions of the board of directors, with written notice also to the chair of the board of auditors. Again, according to the Italian Civil Code, directors are held liable to the company's creditors for non-compliance with their duties concerning preservation of the company's assets. The action can be brought by creditors when the company's assets prove insufficient to satisfy their claims. In the event of bankruptcy or compulsory administrative liquidation, the action against the directors can be brought by the receiver in bankruptcy or by the commissioner. A waiver of the action by the company does not prevent the company's creditors from exercising their legal rights against the directors. Transactions carried out by a debtor prior to the date of the bankruptcy declaration may be subject to claw back under the Insolvency Act upon certain conditions. The 'suspect period' varies from two years to six months prior to the bankruptcy declaration depending on the nature and characteristics of the scrutinised transaction. It should be noted that in the event the bankruptcy declaration occurs after the filing of a petition of a concordato procedure, the suspect period commences on the day in which the petition was published in the company register. pledges, anticresi, voluntary and judicial mortgages (mortgages created by an order of the court) perfected on the debtor's assets during the six-month period preceding the declaration of bankruptcy to secure overdue debts. The reform aimed at creating effective measures for limiting losses in financial distress situations and at providing debtor companies with appropriate measures to promote rehabilitation with the intent to provide benefits for the employment sector and, more generally, the national economy. The most groundbreaking changes introduced by the reform affect the composition with creditors proceedings and include (1) the possibility for qualified creditors to file competing proposals; (2) the obligation to reimburse a minimum percentage of unsecured creditors; and, in the event the concordato plan provides for the transfer of the company, a going concern or key assets; and (3) a duty for the court to start a procedure to research the best offer. Creditors representing at least 10 per cent of the total debt are entitled to file a proposal for a concordato preventivo plan, which shall then be evaluated by the creditors alongside the one filed by the debtor. This right is not granted if the concordato plan filed by the debtor provides that at least 40 per cent of unsecured creditors are repaid (30 per cent if the plan provides for business continuity). A concordato plan that does not provide for business continuity but aims at the liquidation of the debtor's assets for the benefit of the creditors shall provide that at least 20 per cent of the unsecured creditors are repaid. The court shall start a compulsory tender for the research of the best offer in the event the concordato plan provides for the transfer of the company, of a going concern or of key assets. Offers will be compared on an economic basis. The court is required to set the criteria for the tender, to be determined on a time-to-time basis depending on the specifics of the case. The mechanism of silenzio assenso concerning the approval of the concordato plans has been removed (silenzio assenso meant that a creditor who did not express his or her vote to a concordato proposal would be deemed having voted in favour of the proposal). This amendment, jointly considered with the new provisions on the minimum threshold of 20 per cent and on the competing proposals, makes the approval of a concordato proposal more challenging for the debtor. not granting the financing would result in the disruption of business continuity. The new Article 182 septies of the Insolvency Act provides that, in the event the majority of the total debt is due to credit and financial institutions, a restructuring agreement entered into by the debtor and creditors holding at least 75 per cent of credits falling into such category is automatically binding for creditors holding the remaining 25 per cent of the credits provided that all creditors have been duly informed about the procedure and all creditors belonging to the same category are treated pari passu. the completion of the liquidation procedure shall occur within two years of the bankruptcy declaration. Time extensions can be granted in specific circumstances. A further cause of revocation of the receiver has been introduced by the Law Decree No. 69, dated 3 May 2016 in the event of non-submission of the periodical report for the income distribution. The revocation cause applies provided that the liquidation procedure has generated income to be distributed. Further amendments have been introduced with the intent to facilitate the obtainment of financing by entrepreneurs in the course of their business activity. Entrepreneurs can grant pledges on movable assets (excluding registered movable assets) to guarantee their debts. The pledge shall be executed in writing and shall describe the parties, the assets, the credit and the maximum amount guaranteed. The guarantee becomes effective with the filing in the registry of non-possession pledges held by the Italian Revenue Agency. In the event of enforcement of the guarantee, the sale is carried out by the creditor on the basis of a competitive procedure and according to the value appraisal. Parties can provide for the possibility to lease the assets; in this case the instalments will be accounted for up to the full reimbursement of the debt. In case of bankruptcy, the sale is only admitted provided that the creditor is ranked as privileged. To assist financing with guarantees, entrepreneurs can also transfer properties in favour of banks or credit institutions. The effectiveness of such transfers is subject to the condition precedent of non-payment for a period of six months after the expiry of at least three non-consecutive instalments unpaid. in the event the court decide for creditors' meeting by way of electronic devices, the discussion on the proposal of the debtor, and eventually on the competing proposals, is regulated by way of the decree issued by the court at least 10 days prior to the date scheduled for the meeting. It is worth mentioning that when dealing with distressed companies, either as an investor, debtor or creditor, special attention must be paid to Law Decree No. 231 of 8 June 2001 (Law 231), which concerns the administrative liability of legal entities, companies and associations without legal capacities, and the consequences of its violation by the company. In particular, the application of Law 231 becomes more important when the distressed situation of the relevant company is a consequence of (or simply occurs in the context of) the commission by the entrepreneur (or by the board of directors) of specific crimes. The commission of those crimes can trigger the submission of the company itself to certain sanctions, including the confiscation of the company's properties, if the company did not create a system capable of protecting itself from the negative consequences of the commission of those crimes by physical individuals operating in the name or on behalf of the company. Therefore, in evaluating a business opportunity, the investor has to take into account any possible consequences in the event that a violation of Law 231 has been charged to the company. In fact, the creditor's right to be satisfied by the company's assets or the company's right to recover from the distressed situation (sometimes) thanks to the intervention of a third-party investor could be overridden by the state's interest in confiscating all (or part of) the assets of the company, to the detriment of creditors and all other interested parties. According to a recent decision of the Supreme Court, this principle, according to which the interest of the state has priority over the interests of the creditors, has been slightly overridden, to the benefit of the creditors and the company. This decision is quite important and it would be suitable for a provision of law to be implemented to confirm these principles. On 20 May 2015, the European Parliament issued the new Regulation (EU) 2015/848 (the Regulation) on insolvency proceedings, which became effective on 26 June 2017 and replaced Regulation (EU) 1346/2000. Article 86 on information regarding national and European insolvency proceedings has started to be applied from 26 June 2016. The new Regulation has been developed in the context of a new awareness of insolvency. The aim of the Regulation is no longer the sale of the company assets to achieve the reimbursement of the creditors, but is mainly the saving of the business and the company's productivity. a duty of cooperation between different Member State courts has been introduced in case of insolvency proceedings regarding two or more companies part of the same group. The Regulation applies from 26 June 2017, with a few exceptions among Member States. Since 1942, when the Insolvency Act was promulgated, the structure of these regulations, despite numerous legislative interventions, has remained essentially the same: it is focused on bankruptcy. The scenario is set to change radically in the coming years. In particular, the reform process, which began in February 2017 with the approval by the Council of Ministers of a law bill consisting of 15 articles, drafted by the Rordorf Commission, has reached a turning point. In fact, on 30 October 2017, Law No. 155/2017 was published in the Official Gazette of the Italian Republic concerning the delegation to the government for the drafting of a consolidated act for company crisis and insolvency. The text of the law coincides with the text approved by the Council of Ministers on February 2017, as no amendments were made by the Italian Senate. It is worth noting that the bill, inter alia, provides for the removal of the word 'bankruptcy' in the consolidated act, given the negative meaning and effects that are related to this word. The aim is, therefore, not only the merging, but also the enactment of a full 'restyling' of the rules governing bankruptcy and restructuring procedures, also taking into account the experiences accomplished by the practice in foreign countries. The main goal is a simplification of current legislation to make it more intelligible, also in the interest of non-professionals, and a noteworthy reduction of the costs related to the proceedings. Particular attention has been paid to the category of the debtors, who, in most cases, are people with a low or absent degree of juridical and economic knowledge and are particularly exposed to the debt growth risk. The legislative process is currently incomplete. The Italian government will have 12 months from the effective date of the Law to adopt one or more legislative decrees that might completely rewrite the bankruptcy law. 1 Tiziana Del Prete is a partner at Grimaldi Studio Legale. 2 Article 67 of the Royal Decree No. 267/1942 (Insolvency Act).